Polluted stormwater runoff from construction sites often flows to MS4s and ultimately is discharged into local rivers and streams. Of the pollutants listed, sediment is usually the main pollutant of concern. Sources of sedimentation include agriculture, urban runoff, construction, and forestry. Sediment runoff rates from construction sites however are typically 10 to 20 times greater than those of agricultural lands, and 1,000 to 2,000 times greater than those of forest lands. During a short period of time, construction sites can contribute more sediment to streams that can be deposited naturally during several decades. The resulting siltation, and the contribution of other pollutants from construction sites, can cause physical, chemical, and biological harm to our waters. The Construction Site Runoff Minimum Control Measure consists of Best Management Practices that focus on the reduction of pollutants to the MS4 from construction activities that result in a land disturbance of greater than or equal to one acre. Reduction of stormwater discharges from construction activities disturbing less than one acre will be considered if it is part of a larger common plan of development that would disturb one acre or more. Described in this section is, the legal authority mechanism that will be used to require erosion and sediment controls; enforcement procedures and actions to ensure compliance; requirements for construction site operators to control waste such as discarded building materials, concrete truck washout, chemicals, litter and sanitary waste; procedures for site plan review which incorporate the consideration of water quality impacts; procedures for receipt and consideration of information submitted by the public; and procedures for site inspection and enforcement of control measures. The stormwater regulations for Construction Site Runoff Control apply to privately-owned and MS4-owned and managed projects. Therefore, the goals described in this section have application to both types of projects. Ensure that construction site operators have received erosion and sediment control training before they do work within the MS4 and maintain records of that training. Determine the appropriate BMPs and measurable goals for this minimum control measure to ensure the reduction of all Pollutants of Concern (POCs) in stormwater discharges to the Maximum Extent Practicable. This ordinance authorizes the Town to enforce a program that reduces pollutant runoff from construction sites. Enforcing permit requirements on developers/owners/operators that do not comply with regulations. The Town of Canandaigua will also provide information on available training to developers, contractors, and design engineers in order to inform them of the regulations. The Town of Canandaigua maintains an inventory of active construction sites, and inactive permitted construction sites. Appendix R ‘Construction Activity Permits’. The Town periodically reviews and updates the construction permit database. 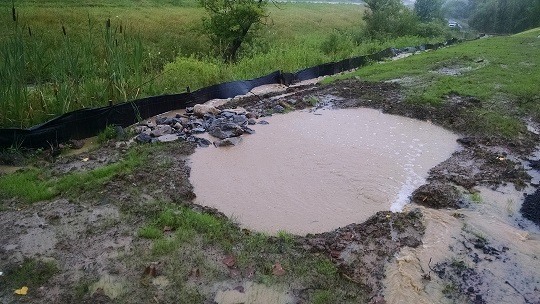 Amend the stormwater law as necessary to maintain the NYS stormwater standards and requirements as defined by the current or any future NYSDEC permits pertaining to stormwater management activities. Maintain, document, and further implement existing procedures for the public to request information, and to relay concerns to the representative of the municipality. Provide training for any town representatives that will be completing the construction plan reviews for the town, including planning and zoning boards. 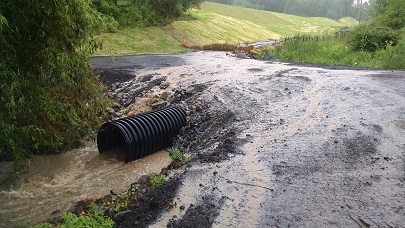 Conduct SWPPP review (with assistance from Town Engineering) for all sites within the Town of Canandaigua where disturbance is one acre or greater to ensure consistency with State and local sediment and erosion control requirements and complete the SWPPP Acceptance Form. Educate the local construction community on the construction plans review process. Follow standard Town Approval Process and provide notice to the public that a project will be open for review and comment. Notify owners/operators of local construction sites who are in violation of the standards as defined by the General Construction Permit. Maintain records of plans reviewed and approved under this program. Maintain, document, and further implement existing inspection forms and procedures based on the adopted local laws regulating construction sites within the Town of Canandaigua that disturb one acre of land or more. Conduct and report on inspection procedures and educational efforts to familiarize town staff and the local construction community with local stormwater regulations relating to construction activities. Maintain, document, and further implement existing internal procedures for tracking new and on-going construction activities. Take action against owners and/or operators of local construction sites that are in violation of local construction stormwater regulations using the enforcement regulation outlined in the adopted local laws. Maintain records of construction site inspections, enforcement actions, and corrective actions. Educate municipal staff and the local construction community with regards to local inspection procedures. Inspect and maintain records of all construction sites where one acre of land or more is being disturbed using appropriate inspection procedures and forms to ensure compliance with local stormwater regulations.